This plugin allows you to collect Authorize.net AIM payments using Formidable Forms. You must have an Authorize.net plan in order to use this add-on. Learn more about Authorize.net. In order to take Authorize.net payments on your site, you will need an SSL connection. Authorize.net payment forms require Formidable Forms Pro. If you haven't already done so, install and activate Formidable Forms Pro. In your WordPress admin, go to 'Formidable' → 'Add-Ons' and click the 'Install' button for the Authorize.net WordPress plugin. Go to Authorize.net sandbox and sign up for a sandbox account. Once you receive your credentials via email sign in and follow the merchant account instructions below. Please make sure your environment is set to testing if you are going to use a sandbox account. Sign up for an Authorize.net merchant account or login if you already have a merchant account. Please make sure your environment is set to Live before using your form. After the Authorize.net plugin is activated you’ll need to set up Formidable Forms to integrate with your Authorize.net merchant account. To do this follow the steps below. Click Account tab from your Merchant account home page. Click 'API Credentials & Keys' (under Security Settings). Copy your API Login ID and paste it into your Formidable → Global Settings → Authorize.net → API Login ID setting. Navigate back to your Merchant account 'API Credentials & Keys' page. Select 'New Transaction Key' and 'Submit' to get a Transaction Key. Copy the new Transaction Key and paste it into your Formidable → Global Settings → Authorize.net → Transaction Key setting. Copy the new Signature Key and paste it into your Formidable → Global Settings → Authorize.net → Signature Key setting. If you would like to collect payment info via a credit card in your Authorize.net payment form, add a Credit Card field to your form. Learn more about on how to store credit card information. If you would like to collect e-checks, follow the instructions below. Add two Number fields to your form: one for a Routing number, and one for an Account number. Add a Single Line Text field to your form for the Bank Name. Follow the instructions below to link the above fields with your form action. Please note the following security risks when collecting eCheck and credit card information. It is not recommended to collect and store full credit card or bank information as it comes with added liability. Whenever you are collecting sensitive information, you should use SSL on your site. Depending on your web host, you may be able to get free and easy SSL through Let's Encrypt. Please contact your web host for information on how to set up SSL on your site. Once you have finished setting up the fields that allow a user to enter their payment information, you will want to set up a form action in your Authorize.net payment form. Use the following instructions to set up your form action. Go to the form's Settings > Form Actions. Click on the 'Collect Payment' shopping cart icon. In the first section, fill in necessary information such as the description of the payment, the payment amount, whether it will be one time or reoccurring, the currency of payment, and lastly if you want to use Authorize.net (credit card), an eCheck, or both. If you are collecting eCheck info, let the form action know which fields hold the bank account info. Let the form action know which fields hold customer information. If you are collecting shipping information, then make sure this box is checked. Then, let the form action know which fields hold shipping information. If you want to change a field's value after payment is either completed, refunded, or fails, you can do so in the After Payment section. As with nearly all form actions, you can add conditional logic for collecting payment. When you create a form action that has both 'Authorize.net' and 'eCheck' enabled, a Gateway field will appear in your form automatically. This field will have options for either 'Credit Card' or 'eCheck'. The purpose of this field is to allow the user to input which payment method they will be using. This allows you to either show the credit card field, or the fields for users entering eCheck information using conditional logic. You can follow the instructions below to conditionally show the payment fields. 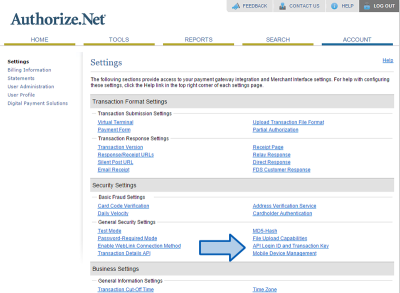 First, follow Steps 1-3 above to add a form action that allows both Authorize.net (credit card) and eCheck. After doing so, update the form. Next, follow the instructions above to add both a Credit Card field and fields for eCheck information if you haven't already. To set up conditional logic for the Credit Card field, click on the field options for the field and click "Use conditional logic", then choose the Payment Gateway equals "authnet_aim" without the quotes. It should look like the following screenshot. If you would like to send an email notification after a completed payment or transaction, follow the instructions in this documentation on how to trigger actions after payment. Show a payment receipt using the shortcode [frm_payment_receipt id=25 layout=right]. Replace 25 with the ID of the entry you would like to show a receipt for. In a View or the success message, you may use [frm_payment_receipt id="[id]"]. If you run into issues when trying to complete a payment, start by checking your log file for clues. You can find this file in plugins/formidable-authorize-net/formidable-payments/log/results.log. Scroll to the bottom of this file for the most recent logs. 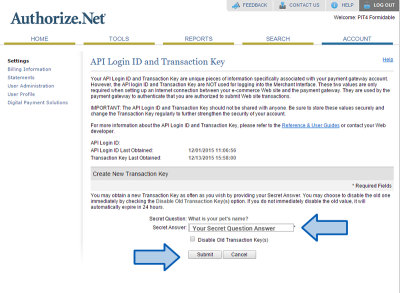 Follow the instructions here to set your Authorize.net API Login ID and Transaction Key. Make sure that you copy the correct API Login ID and Transaction Key. Select Formidable → Global Settings → Authorize.Net. Paste the Authorize.net API details and click the Update Options button. See the code example to use a custom invoice number.